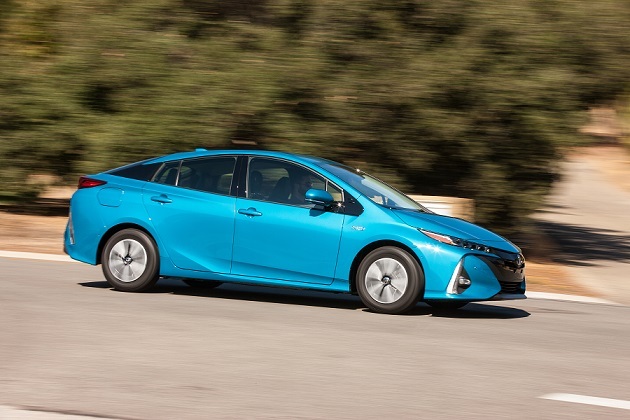 More luxury and tech enters the picture in the Prius Prime Advanced, which adds a heated steering wheel, remote climate control system, rain-sensing variable intermittent windshield wipers and auto-dimming rearview mirror with HomeLink® universal transceiver.LED fog lights help bolster visibility, while a color head-up display (HUD) helps the driver keep focused on the road by projecting vital information onto the lower portion of the windshield. HUD displays include speedometer, hybrid battery charge Hybrid System Indicator navigation and the various systems within TSS-P. The safety tech roster grows with Blind Spot Monitor (BSM) with Rear Cross-Traffic Alert (RCTA) and Safety Connect®, which includes Emergency Assistance, Stolen Vehicle Locator, Roadside Assistance and Automatic Collision Notification. (Includes complimentary three-year trial subscription)." And the Prime Advanced model has another cool feature: It can park itself! Its standard Intelligent Clearance Sonar (ICS) with Intelligent Parking Assist (IPA) uses ultrasonic wave sensors to size up a parallel parking space and then, when activated by the driver, can steer the car into it. The system can also reverse the vehicle into a perpendicular space and automatically steer it out of a parallel space. If you drive into a tight spot, such as a narrow alley or driveway, Intelligent Clearance Sonar provides visible and audible warnings if you get too close to obstacles on the vehicle’s sides. This is about the most out of this world car intrior I've ever seen. the angular, horizontal dash looks like nothing you 've ever seen unless you have driven a Prius. There aren't any round gauges with needles, for example, and it's all dominated by an 11.6 inch touch screen which includes a huge map for navigation operations, along with controls for audio and climate control. And therein lies the problem. You really have to search to find where those two items are located, and they are at the bottom of the screen. The trouble is that the system is so complex that you need to sit down for some time with your owners manual, and even then, it will take you some time to get used to it. None of is intuitive either. But the Prius Prime is way, way ahead of its time, and its level of technology is nothing short of dazzling. In the market for a hybrid or hybrid plug in? Don't miss this one. You do so at your own risk.